The city of San Juan offers the best of both worlds when it comes to nightlife. Choose from romantic and relaxed, to vibe to vibrant, to chic and exciting. Your hardest task will be choosing from over 200 entertainment options including casinos, nightclubs, lounges, music venues, concerts, plays, and cultural events held throughout the year. Walking tours don’t end at sunset. You can book a great tour of the Old City at night and see it in a whole new light. Once you get out, you’ll have to force yourself to go back to your hotel, because San Juan offers so much, it’s hard not to want to take it all in, all night. 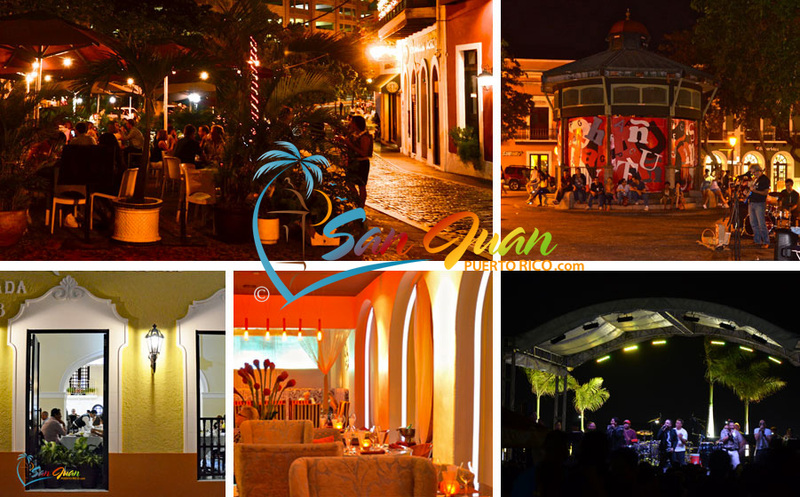 As we mentioned previously, San Juan is two distinct cities in one, and they both offer a different vibe at night. If you want a more romantic scene at night, then head over to Old San Juan. As you walk around Old San Juan at night, your senses will become overloaded with sights, sounds and delicious smells. Black, wrought iron lanterns light up and radiate a golden glow to the cobblestone streets, while the massive city walls become more subdued. You’ll hear the sounds of salsa, flamenco, jazz, and classical music coming from restaurants and clubs. As you walk, your appetite will grow with the scent of delightful cuisine that makes San Juan so popular in the Caribbean. In addition, you’ll often find live music and events taking place at the plazas and squares around Old San Juan. And best of all, they’re free! Be sure to wear comfortable shoes, as many places offer free salsa lessons. Popular streets at night are South Fortaleza Street (SoFo), Calle San Sebastian, and Calle del Cristo, offering chic dining spots, nightclubs, and lounges. If you’re in San Juan on a Sunday night, be sure to take a walk along Paseo de la Princesa and enjoy delicious food and drinks from local kiosks, live music, and the sunset over the San Juan Bay. Calle Recinto Sur offers a nice variety of restaurants that are lively at night and an easy walk from Bahia Urbana. Head to New San Juan’s Condado, Ocean Park, or Isla Verde (Carolina) districts for trendy beach restaurants with live music, casinos, and nightclubs. Ashford Avenue is the most exciting nightlife strip in Condado, Isla Verde Avenue in Isla Verde, and Calle McLeary in Ocean Park. You may also want to check out La Plaza del Mercado (a.k.a. La Placita) – a traditional marketplace in the Santurce community that transforms into a lively festive place with live music and great food from Thursday to Sunday nights. It is located across the Baldorioty de Castro Highway (on the other side of Condado) at Dos Hermanos and Capitol Streets. San Juan tourist destinations are safe with a strong strong and noticeable police presence giving visitors peace of mind. Like any other city in the world there are neighborhoods that have a history of crime. Feel free to stop and speak to a policeman if you have any questions about safety. Of course, common sense is always advised when traveling to any destination.